THE PENSIONS’ BATTLE has been the centrepiece of the generalised struggle against government-imposed cuts over the last year. 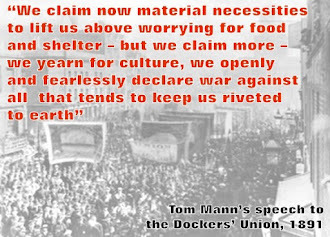 If the trade union movement was now to evacuate the scene of battle without deploying its full strength, it would be an enormous setback. That could, in turn, bolster the government at a time when it is on the back foot. This would have serious consequences for the struggle against the panoply of cuts, more than 90% of which have yet to be introduced. And yet this is precisely the danger which is posed by the defeatist approach of the right wing of the TUC, led by general secretary Brendan Barber, together with unions like Unison. Their acceptance of the ‘heads of agreement’ on pensions, despite promises of future action, broke the common front on this issue. Now, the leadership of the biggest teachers’ union, the NUT, is prevaricating. The union received an overwhelming majority in a consultative ballot for national strike action, to join up with unions like the PCS civil servants and UCU lecturers’ union on 28 March. But the nominally left leadership first of all rejected national strike action. Then, under pressure from some on the left, including Socialist Party members, agreed to regional action in London on that day. This retreat, in turn, made it impossible for the PCS to call on its members to come out in a national strike on 28 March. The PCS’s own consultative ballot, which resulted in overwhelming support for national strike action, was specifically linked to other unions, such as the NUT, coming out on the same day. 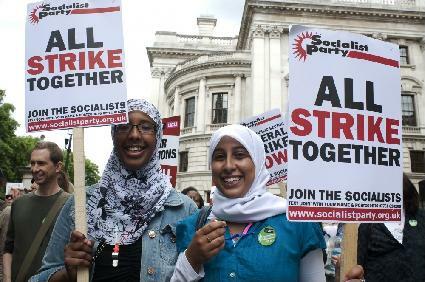 But, despite the confusion, the 28 March strike in London was very successful, with up to 10,000 teachers and supporters marching through London. There was, therefore, an expectation that the Easter annual conference of the NUT would decide on decisive national action to defeat the government’s attacks on pensions. Notwithstanding the inaccurate headlines in the press, which gave the impression that the union had come out in favour of a serious strategy of national action, this was not the case. The national leadership once more dithered and, in effect, decided not to decide. Its muddled message was that a combination of measures including regional strike action – not necessarily on the central issue of pensions but also on the government’s proposals to introduce regional pay – would be deployed but with national action not completely ruled out. It gives the impression that they have no confidence that teachers will respond to a fighting lead. Yet when they have been called upon to demonstrate their support, teachers have responded magnificently. This was shown by the tremendous, militant demonstration on 28 March in London. Kevin Courtney, NUT deputy general secretary, said that teachers would be “very angry” when the first phase of the three-year increase in contributions kicked in this month, leading to an overall average contribution increase of 50% over three years. “For the first time since the 1930s, we think, teachers will see a reduction, a cash reduction, in their take-home pay, because the contributions go up”. The NUT has calculated that an inner-London teacher with ten years’ experience will lose an extra £49 a month from April, which is expected to rise to £123 a month by April 2014. The central issues around the pensions dispute – the extension of the pension age, the raised level of contributions, and declining benefits – are beginning to be widely understood, discussed and rejected by teachers. Strikes are a necessary stage in the development of the consciousness of workers, including teachers who increasingly see themselves as working in factory-like conditions, under enormous stress, heavy workload, etc. Moreover, they have considerable power, as indicated by the howls of anguish from parents and employers whenever teachers go on strike! The strikes have allowed the acquisition of invaluable experience by teachers, which can begin to separate out and develop a new layer of teachers who will play a key role in changing and radicalising the unions. A successful outcome of the pension struggle depends upon the NUT, together with the PCS and UCU leaderships, deciding now for national strike action, perhaps on 10 May. The perception that many workers still have is that the current situation is merely a passing phase – that pensions, job opportunities, terms and conditions can just be ‘trimmed’ now and, in the future, ‘better times’ will return. This is a complete myth. The reality is that capitalism offers a future of ‘eternal austerity’. Don’t just take our word for this. The Observer pointed out: “Worse is to come. Last week, the Organisation for Economic Cooperation and Development predicted that Britain could face decades of spending cuts and tax increases”. (15 April). The OECD should know, representing as it does the richest and most ruthless capitalist countries in the world. But a determined campaign by the unions on pensions – which, we repeat, includes national strike action – could not be better timed, given the weakness of David Cameron’s government, its policies in tatters. Support for the government has collapsed to its lowest since the 2010 general election. The Tories have dropped from 37% to 34%, with their Liberal Democrat ‘allies’ in government on 11%. Cameron is openly attacked as “Britain’s first dilettante prime minister since Herbert Asquith… Mouth open, but hands-off.” (Anthony King, Financial Times.) Thatcher herself, King points out, contrary to later impressions, proceeded cautiously in her first period in office. Cameron proceeded very quickly to attack the working class. However, what King does not take into account is the much deeper crisis of capitalism today. Yet on managing the economy, where Cameron was previously ahead in polls, now 53% of people say they do not trust him to lead the country through the economic turbulence! The consequence of all this is that Labour is up to 40%. This has nothing to do with support for Ed Miliband. The sensational result in the Bradford West by-election illustrates this, as does the fact that Miliband’s personal ratings are on minus 41%! Overall, latest figures show more than 2.6 million unemployed people are chasing 450,000 vacancies across the country – a ratio of nearly six to one. James Ball in the Guardian commented: “the worst affected areas are spread all round the country: Clackmannanshire in Scotland has 35 jobseekers for every vacancy; the Isle of Wight has 21; Haringey, London, 19; and Inverclyde 18”. These figures apply not just to full-time jobs but part-time jobs as well. If it were just full-time jobs that were being chased it would mean that four million rather than 2.6 million would be chasing them! This truly horrendous unemployment figure, which now has a tendency to become permanent, criminally affecting young people, shows the daunting scale of problems which beset working-class people on the basis of capitalism. It makes it even more urgent for the labour movement to resist tooth and nail the offensive of the government and the ruling class. The ruling class of Europe is attempting to use the spectacle of impoverished Greece as a scarecrow in order to prevent resistance by the working class in their own countries; ‘see what happens when you engage in senseless strikes and demonstrations’. Nothing could be further from the truth. If you fight it is possible to defeat or at least limit the damage. Weakness invites aggression. This is the real lesson of Greece and of all workers’ struggles. It is the lesson of the pensions’ battle; resolute leadership combined with correct policies and programme can yet inflict defeat on the government and hasten its downfall. A political aternative, however, is also vital. We have had a dramatic demonstration of the seismic shift which is underway in British politics in the Bradford West by-election, with George Galloway’s spectacular victory. The main parties – Tories, Lib Dems and New Labour – are increasingly seen, in the words of Galloway, as “three cheeks of the same backside”. When a real alternative is presented, increasing layers of workers and youth will opt for this. This is revealed not just by Galloway’s victory but also by the massive response which the Left Front candidate in the French presidential elections, Jean-Luc Mélenchon, has received. In opinion polls, his share of the vote has doubled to 15% – latest polls put him at 17% – since he started his campaign. The conditions are there already for the beginnings of a new mass party of the working class.